Last year was the 33rd year of Aspen Food & Wine; for Levanto’s Mangialonga it was a 20th anniversary. Aspen’s Food & Wine is attended by 5,000 foodies from around the world and celebrity chefs. 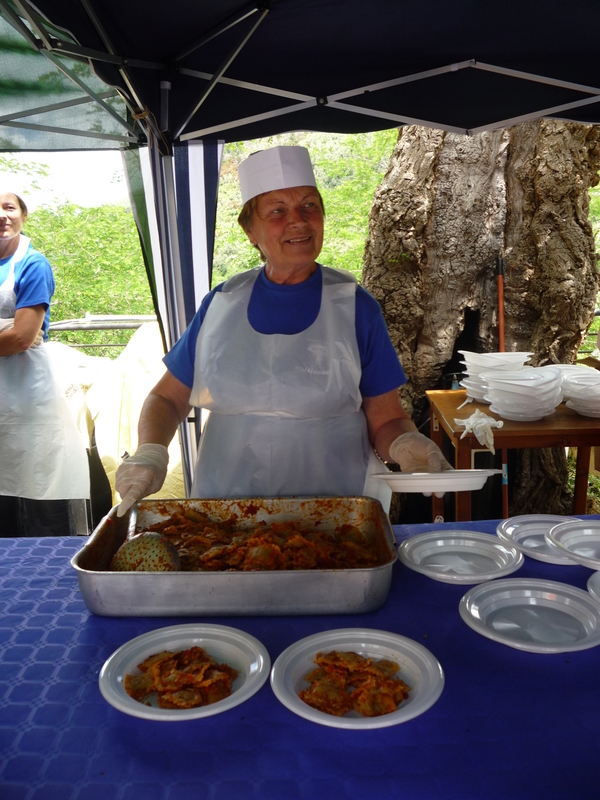 Levanto had one day of 1,200 hikers, a lot of Nonna’s in the kitchen, and local Ligurians enjoying food, hiking and occasional dancing with friends, family and strangers. Levanto is a gateway to the Cinque Terre, Italy’s famed five towns clinging to the cliffs and coastline in the Liguria Region. It’s the first train stop just north of the Cinque Terre, has a larger town center and feels a little less touristy. 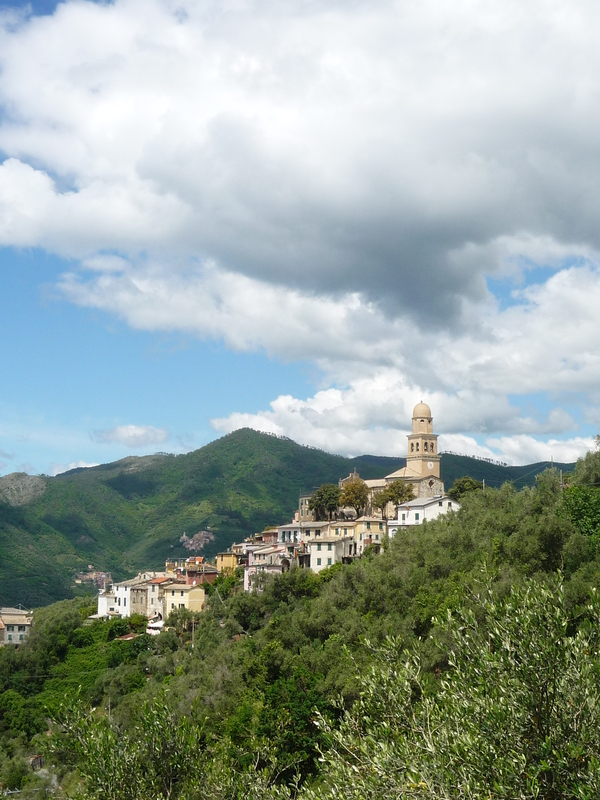 Like its Cinque Terre neighbors, it’s both a coastal resort town and great base for hiking. It boasts a large beach you can surf at, is surrounded by 16 medieval villages and plenty of trails for exploring. I found the Mangialonga Levanto while researching festivals and planning a trip with my friends Ann & Robin. When traveling I like activities that are a bit off the beaten track providing a deeper cultural and local food experience. I suggested we participate in this festival, they agreed it was not to be missed and a great way to cap off our 10 days in Italy. 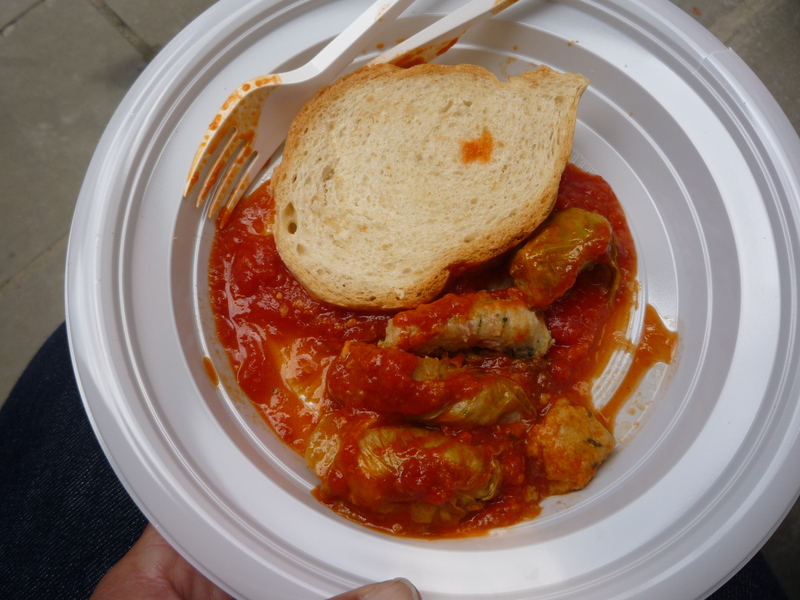 We bought our tickets the first day they went on sale and two months later we were in the second group departing Piazza Cavour donning our official blue handkerchiefs while heading for the hills to begin our food & wine odyssey. The groups were spread 20 minutes apart but by the second and third stops they had blended in a slow-motion trek through the valley above Levanto. The brochure published by Consorzio Ochhio Blu listed the official distance of the trek at approximately 15 km. The well-marked path was strung together by a combination of local roads, cobblestone streets and lush wooded paths filled with wildflowers and even wild asparagus. We walked through lemon trees, olive groves and grape vines; past donkeys, gardens and a farmer hard at work. 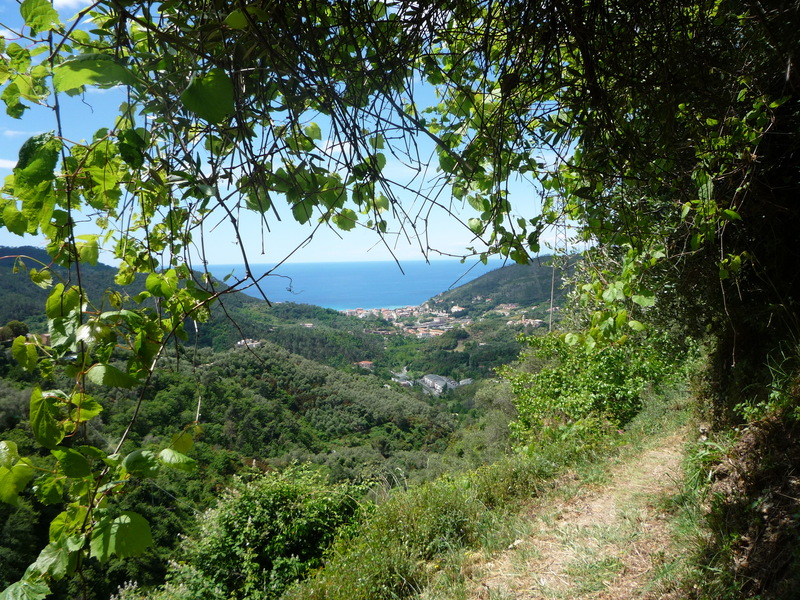 Every turn of the path revealed a different, beautiful vista of the sea, charming villages and verdant hillsides. Each May this festival alternates between 2 paths connecting different combinations of 16 medieval village communities. The menu is published several weeks ahead of time, each village offering one part of the 9-courses served by locals. The anchovy soup was the biggest surprise; it was a thick combination of anchovies, tomatoes, olive oil and fresh herbs. As tasty as the soup was, the ravioli with meat sauce and stuffed lettuce leaves tied for my first place vote. We also enjoyed the other offerings of focaccia with sage, bread with minced lard, chickpea fritters (all agreed the best we had during our stay on the Ligurian coast), fava beans with salame and castagnaccio (a very dense and not particularly sweet chestnut desert). DJ’s and singers accompanied the food at each stop spinning everything from the 70’s hit “Gloria” to current favorites like PitBull and traditional folk tunes. In total we visited 8 villages working our way back to the Levanto grand finale complete with espresso, cookies, liqueur and a DJ to bring the party full circle into the night. The walk was estimated to take 3.5 hours of actual hiking time; with additional time to eat, drink, enjoy the music and great people watching it took us 5.5 hours start to finish and was well worth the effort. Sometimes called Mangialunga (Long Eat), sometimes Mangialonga, it’s a bit like “tomayto” or “tomahto”. Both are correct. Levanto isn’t the only town in Italy to host an event like this, or Europe for that matter. Similar Italian events occur in La Morra, Val Graveglia, Recco, Fivizzano, Badia Prataglia and Paspardo each year. Mendrisio, Switzerland hosts both a spring and winter version. Walking wine and food events in the United States include the “Tahoe City Wine Walk” (California), “Food & Wine Walk of Red Bank” (New Jersey) and “Vintage Redlands” (California); each offering a more flat, condensed version. Though a newcomer to this type of event, it won’t be my last. Food. Wine. Hiking. It’s the Mind Body Spirit ideal of Aspen & life balance exemplified. You have your pick of festivals to attend this weekend in Italy: lemons or fish on the Ligurian coast, rowing in Venice or running in Gubbio. Rather than choose between them, I decided to give you a taste of each. This Saturday, food is the focus on the Ligurian coast. Monterosso al Mare is the northern most stop of the Cinque Terre (five lands) full of picturesque pastel-colored houses along the Mediterranean coastline. The Festa del Limone in Monterosso highlights the lemon in food offered by vendors throughout the old town. Each year a special gastronomic walking tour is also offered and you can eat your way through each course at different stops in the old and new town, including a visit to a fragrant lemon vineyard. There is yellow everywhere as residents compete with elaborate window displays using lemons, children run lemonade stands, folk musicians stroll and street food to eat, including some awfully yummy porchetta! My friend Robin and I took the tour last year and weren’t disappointed in the quality of food or atmosphere; our group was expertly lead by Kate Little of Little Paradiso Tours and the plucky Valentina (the namesake of Villa Valentina in Levanto, a high-end B&B). Also this Saturday, The Sagra del Pesce in Camogli has been held since 1952 and is a highly anticipated event. A huge quantity of fish is fried in a gigantic frying pan then shared with locals and visitors. The locals hope it will bring the generosity of the sea to the local fisherman. Retired frying pans are kept and displayed on a wall near the harbor. Every May 15th since the year 1160, the City of Gubbio, deep in the green valleys of Umbria, holds the Corsa dei Ceri. Three guilds challenge each other to carrying three towering candlesticks, each weighing in the 800 pound range, on their shoulders up to the basilica of Sant’Ubaldo. There are events for several days leading up to this grand finale. Vogalonga literally means “Long Row”. It’s a boat race from Piazza San Marco to Burano and back (20 miles/32 km roundtrip). Hundreds of boats take part with many participants in historical costumes. It is held each May 15th and this year is its 42nd celebration.